← John Bell Hood: Dope Fiend? Today, we’re pleased to welcome guest author Anthony Trusso. Although the 20th Maine Infantry gets a lot of attention for its actions at Gettysburg, due mostly to its prominence in the 1993 film Gettysburg, other regiments from the Pine Tree State played important but overlooked roles in the battle. One of those regiments was Colonel Moses Lakeman’s 3rd Maine. 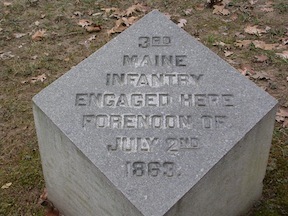 The 3rd Maine, part of Ward’s Brigade in David Birney’s Division of Dan Sickles’ III Corps, numbered 196 men and 14 officers at roll call on July 2. These men from Maine, a shell of their former selves, had received great “world-wide recognition” and veteran status in proving themselves on the battlefields of Virginia, placing many of its former members on the casualty lists. On the morning of July 2, the regiment was located, along with the rest of their brigade, out along the Emmitsburg Road—the road bisecting the battlefield, acting as a halfway point between the opposing lines of battle. At around this time, reports were coming in of heavy gunfire, which could be heard coming from Seminary Ridge, roughly one mile to the front of the regiment. This gunfire was coming from a skirmish occurring in Pitzer’s Woods between members of Hiram Berdan’s First US Sharpshooters and Alabamians under Cadmus Wilcox, who anchored the right flank of the Confederate Army. This firing had started earlier in the day when 100 of Berdan’s sharpshooters, while moving along the ridge on a reconnaissance mission, had encountered a Confederate advance. As the sharpshooters advanced as a “strong line of skirmishers,” they came upon the Alabamians and gave them a “heavy volley of musketry on the right flank and rear.” Thus, the second day at Gettysburg had begun as accidentally as the first day did. At around noon, the 3rd Maine had made its three-quarter mile journey across the open ground between its original position and the wood line along the Ridge. Upon reaching this “thick cover of oak and chestnut,” the engagement occurring between the sharpshooters and the Alabamians was in clear view of the Mainers. As they moved forward, the Mainers began to take fire from the 10th and 11th Alabama regiments, which had already forced parts of Berdan’s men to begin to fall back—right into the 3rd Maine. Over the next twenty or twenty five minutes, depending on which side’s accounts you read, both opposing lines blazed away at each other in the early summer sun. Finally, Berdan, in command of both his sharpshooters and the New Englanders, gave the order to fall back. All told, though this skirmish in Pitzer Woods did not last terribly long, the casualties suffered by the 3rd Maine continued to add to their name as a respectable unit in the Army of the Potomac. Of the 210 Mainers that had moved forward from the Peach Orchard twenty minute prior, 48 would be killed, wounded or missing. Of these 48 casualties, it is estimated that over 30 of them were captured by the Alabamians during the fight. This short skirmish in the Pitzer woodlot had implications, typically overlooked, for both how the remainder of the battle would play out and for these veterans from Maine. The principal achievement of this reconnaissance was that because of the efforts of the men from Maine, the Union brass now knew that the Confederate line was beginning to stretch farther to the south and, because of this, would overlap the left end of the Union line. This reconnaissance could have also stalled any Confederate attack against the Union line—although with hindsight we can see that the Confederate attack would not kick off for quite a few hours. The memory of these soldiers from Maine on the morning of July 2 is remembered by a few monuments on the Gettysburg battlefield set off on a side road accessible from Confederate Avenue. Though oft overlooked and surrounded by many trees, the area gives the illusion that heavy fighting and stories of valor and bravery did not occur there but quite a distance to the south. It is hard to imagine that in the still and peaceful woods surrounding these monuments that the first shots of the bloodiest day at Gettysburg were fired by New Englanders who, through their efforts and loses, far removed from the woods of Maine, added to their reputation as some of the most elite soldiers in the Army of the Potomac. Anthony Trusso is from Union, New Jersey, currently studying history and Political Science at Fairleigh Dickinson University. He has been reenacting the Civil War for last 7 years with the 61st NY regiment. He has also interned with Fredericksburg & Spotsylvania National Military Park. Pfanz, Harry W. Gettysburg, the Second Day. Chapel Hill: U of North Carolina, 1987. Print. Gottfried, Bradley M. Brigades of Gettysburg: The Union and Confederate Brigades at the Battle of Gettysburg. Cambridge, MA: Da Capo, 2002. Print. “Third Maine Regiment.” Maine at Gettysburg. Portland: Lakeside, 1898. 127-33. Print. Maine At Gettysburg, pg 132. Berdan’s OR; Pfanz, Gettysburg: The Second Day, 100. Gottfried, Brigades at Gettysburg, 578. This entry was posted in Battles and tagged 10th Alabama, 11th Alabama, 3rd Maine, Berdan's Sharpshooters, Cadmus Wilcox, Gettysburg, July 2, Moses Lakeman, Pitzer's Woods. Bookmark the permalink.